GrowNYC's Youthmarkets teach local youth about small business skills. 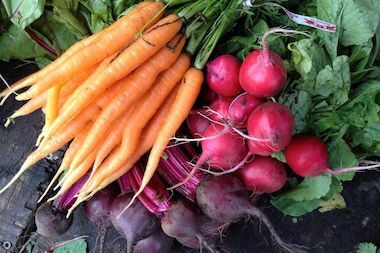 QUEENS — Pick up farm-fresh produce at greenmarkets opening this weekend, operated by youth across the city. GrowNYC's Youthmarkets are open this week, with two in Queens: in Ridgewood on Cypress Avenue between Myrtle and Putnam avenues, and in Far Rockaway on Beach Channel Drive and Beach 58th Street. Both markets open Saturday, and run through Nov. 21. The neighborhood markets employ more than 60 local teens, who learn small-business skills while providing the community with access to fresh food. GrowNYC partners with local groups to keep the markets running. The Rockaway market is operated by the Rockaway Youth Task Force — which also runs a smaller garden near the stand — and the Rockaway Development and Revitalization Corporation. It is open from 9:30 a.m. until 3 p.m.
Ridgewood's market is run by the Myrtle Avenue Business Improvement District, the Ridgewood Local Development Corporation and The Greater Ridgewood Youth Council.